December Featured MCA Member: Michelle Provencal, Thirdlee & Co.
There’s something about the idyllic coast of Southern Maine that seems to pull creativity in to those on shore, with the rhythm of the lapping waves. It blows in on the salt air, inspiring those who live and visit in the region via the incredible geometry of gathered shells and the stark contrast of the sand and sea. 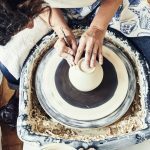 When Michelle Provencal returned to the Maine Beaches region and created Thirdlee & Co., she wanted to make something special, something that she could make exclusively hers; and when one beholds Michelle’s hand felted, sea-inspired ornaments and sculpture, you immediately see that to call them special is an understatement. Following in family footsteps of art-oriented career choices, Michelle studied industrial design at Pratt Institute in Brooklyn, New York. Her grandfather, Bob Lee, was a carpenter, pilot, and commercial artist. Her mother, Roberta Lee, was a photographer, mentor, and avid beachcomber. Michelle found her niche in product design for some of the largest names in specialty retail. She now works as a freelancer, at her leisure, while embracing her multi-generational background in fine craft. With experience in glass, woodworking, ceramics, Michelle wanted to learn something new. She chose needle-felting, and after rigid self-training, her focus combined with an inherited natural talent for design shines brightly in her work. With striking, life like characteristics, Michelle’s designs are thoughtful and pristine, right down to the metal tone of the safety pin used to affix her tags to a finished creation. 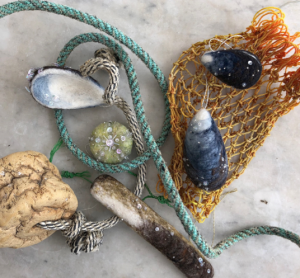 After returning to Maine, Michelle inherited a collection of sea glass, shells, driftwood, and other found objects that were treasures of her mother’s and have become natural foundations for a series one of a kind, mixed media sculptures. 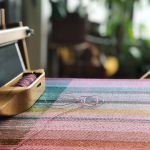 In her Biddeford studio, shared with her husband, she creates in a “happy mess” of wool and various whimsical accoutrements, the centerpiece of which is one of Michelle’s prized possessions: her grandfather’s drafting table. View Michelle’s incredibly realistic, hand needle-felted moon snails, urchins, and mussel shells at the Center for Maine Craft. To purchase online on the Center for Maine Craft Etsy shop, visit www.etsy.com/shop/CenterforMaineCraft, while supplies last.